As part of the BBC's China Week, Tim Luard looks at the Chinese community in the UK, the first of a series of articles on the Chinese diaspora. As China rises in the East, big changes are also taking place in the size, make-up and status of the Chinese community in Britain. 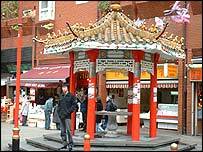 While the bustling, brightly coloured Chinatowns in the centres of otherwise grey and sedate cities like London and Liverpool may be hard to miss - with their oriental arches and red telephone boxes turned into pagodas - the Chinese themselves are often called Britain's "hidden minority". Yet the stereotype image of someone in a street-corner takeaway writing down orders for egg fried rice is almost as out-dated as the picture many Britons still have of a China full of peasants in blue tunics, waving little red books. Johnny Hon is chairman of a venture capital company based in one of the most luxurious new tower blocks in London's Canary Wharf district - similar in style to the high-rise temples of finance now to be seen in Shanghai and other Chinese cities. In one of his suite of offices, banks of TV screens flash up market figures; in another hangs a picture of Tony Blair with the signed inscription: "To Johnny and all at Global". Hon, who is 33 and came to Britain from Hong Kong at the age of 12, is due to meet at least four other prime ministers on a quick business trip he's about to make to the Caribbean. He also makes frequent trips to Beijing - and, naturally, he has friends in the government there too. "I help British companies go to China and help Chinese ones looking to raise funds or invest in the UK," he explained. He believes at least part of the reason for China's dynamic growth is that Chinese are hard workers and good at business - something that also helps explain the rising profile and prosperity of Britain's Chinese community. According to the last census, in 2001, there were 250,000 Chinese in Britain - almost 100,000 more than 10 years previously. Today they are among the highest-earning groups in Britain - and the most likely of all groups to do well at school. British schools and universities now educate more students from China - about 60,000 - than from any other country. China's leaders say they are the cream of the country's youth and will get good jobs when they return, even though many choose to stay on in the UK. The country's first Chinese immigrants were 19th century sailors who settled in Liverpool and London's Limehouse district - next door to the gleaming skyscrapers of today's Canary Wharf, but at that time a rough area of docks, brothels and opium dens. In the 1950s and '60s came a much bigger influx - of farmers from Hong Kong. The collapse of traditional agriculture in the colony's rural New Territories happily coincided with the development of a British taste for foreign food. Soon almost every town boasted its own Chinese restaurant. Ethnic Chinese also arrived from all over South East Asia, settling down to make a quiet living in a way that aroused far less attention than has often been the case with other ethnic minorities. "We may be from many different countries, but we Chinese all work here together like one family," said Millie Lee, a restaurant worker who came in the early 1980s along with other "boat people" from Vietnam. "It's as if we got lost and came together," she said. 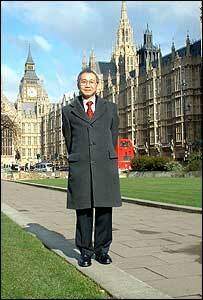 As China opens up, a growing proportion of British Chinese, these days, come from the mainland. But even the ones who have never been there still tend to regard China as "home" - if only the home of their ancestors. Until recently, many felt sad, or even ashamed, at their mother country's poverty and backwardness. Fong Fu remembers the southern Chinese province of Guangdong as a place of poor villages with no toilets. Reports of its transformation into the workshop of the world have made her feel proud, and perhaps also more confident and assertive. "We Chinese do well wherever we are," she said, as she outlined her plans to move on from being a waitress. "We know how to use our opportunities. We work for others for the first three years. But after that we become the boss." The Chinese now coming to Britain - as well as the children of those who arrived earlier - no longer feel the need to find work in catering or other parts of an "ethnic economy", according to Dr Frank Pieke, a specialist on Chinese migration at Oxford University. "Chinese, like others, are increasingly adopting a mobile, transnational lifestyle, moving from one job and one country to another as new opportunities present themselves," he said. True, there are some, like the cockle-pickers who died at Morecambe Bay last year, who pay large sums to come here and then find themselves in jobs at the lowest end of the social scale. But some 50,000 of Britain's Chinese - 20% of the total - now have jobs in law, medicine and other professions. 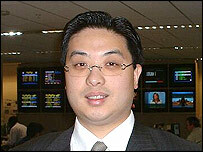 Zhu Yonggen is working as a software engineer in Derby. His lifestyle, food and culture remain Chinese, and he and his family keep a close eye on events at home via the internet and the overseas version of the People's Daily. "We also talk about China with our British friends," he said. "The British are becoming much more aware about our country". The first Chinese to become a British Lord believes Britain is taking more notice not only of China but also of the Chinese community who live here. Lord Chan - honoured for his work in medical science - said it was significant that this year's Chinese New Year celebrations in London had been attended for the first time by the foreign secretary. "We used to be seen as newcomers, only here temporarily," he said. "Chinese have lived and died here for a long time and will continue to do so. But it's only now that China's new prominence has finally focused attention on us."